A throwback to AM radio's glory days (or shall I say radio's glory days), Saturday Looks Good To Me jump and move through AM radio's finest moment. Whether they're taking you to a sock-hop, drooling over The Beach Boys, or cherishing the impact of Motown. They pay homage to the sounds of yesteryear, spinning them with an indie-rock touch, and creating a joyous, retro-rock explosion that is much more modern sounding than you'd think. All without compromising and invalidating their ability to fit perfectly in with the oldies, and make a strong case for why they should be played on the oldies stations. 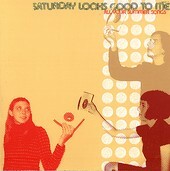 All Your Summer Songs, an apt title for this collection of songs, does its job and does it well. I'll give it a B+.